8:30pm Backyard – Jason joins Kryssie to workout. Kryssie – he’s got little arms maybe I’ll give him the 10’s (10 pound weights). Justin – just imagine if you had been doing this since you got here .. you would be JACKED! Jason – I can’t get too jacked … I don’t have the money for a new wardrobe. 9:30pm HOH room – Shelby – we would not be in a good position if I didn’t win HOH. We would have zero bargaining chips right now. Morgan – like I literally don’t know what we would preach to Jason. We have nothing to leverage with .. no care package. Shelby – we would have nothing but Justin and Kryssie. This is just the power to make sure one of them gets care package. Plus a final four deal isn’t terrible. I think it works out great for all of us. Morgan – it literally helps all of us. First it gets Justin his care package. Then it gets him automatically to the final 4.. hopefully he will take us along with him. Once we do get to the final 4 its good for us 3 because we all have agreed that us 3 girls would take each other to the finale. Shelby – Justin knows that Jason and Danielle are coming for him. Morgan – so there is no reason why he wouldn’t want to work with us. He knows Kryssie is loyal to him. Its an even number of loyal people to loyal people. Nobody is out numbered. Its not bad for anyone. They must think you are taking this deal because they haven’t even asked you about it. Shelby – I never accepted it but I don’t care. If I want to f**king lie to them just so they think I’m taking them… But I will have to ask them again what the safety ceremony is going to be like. It would be so much easier if it was 1 then 2. Morgan – it just makes more sense.. save 1 …there’s only 1 obvious choice. Then let one worry until the next night and put up the other two. It would be way better for suspense. Shelby – I told someone and they said yeah that is a good idea. 10:15pm Kitchen – Jason, Danielle and Kryssie are studying the days and events of the house. Meanwhile – Shelby and Morgan are playing pool out in the backyard. 11:20pm – 12am Kitchen – Shelby, Jason, Danielle, Kryssie and Morgan are hanging out talking about random things. 12:40am – 1:15am HOH room – Justin, Shelby and Morgan. Justin – okay Kryssie isn’t here. Jambalaya gang! They cheers. Shelby – we just need to kill this veto comp. No, not we’re going to …. we are going to kill this veto. Morgan – we are! Justin heads out but says he will come back to hang out later. Morgan tells Shelby that he seems excited about it. I think its the first time someone has shown him excitement and let him have some kind of power. I feel like Jason and Danielle have been like Justin just do this. Do what we want. Shelby – right. I mean the deal is great for him. No one else wants him in the final 4. The don’t want him in the final 4. They want us to take him out for them. We’re giving him a care package. Morgan – and offering him people to work with to get there. Shelby – they might think he’s dumb and won’t work with us but.. Morgan – I knew if this was presented to him in a kind of way he would jump on it. Shelby – I know you’re putting me up … what if we don’t put you up, vote Danielle out and give you the care package?! He was like WHAT?! Morgan – I would rather have him in the house than her. Shelby – yup. As long as we kill veto. Morgan – yup. This is our best bet which solidifies us through next week. Jason and Danielle just guaranteed us next. Shelby – we can literally convince Jason to throw the HOH comp. I’m just really nervous about America’s nom. I really hope its Kryssie. I don’t want to lose another person on our side during my HOH. Morgan – no its about time someone on their side went. I just want this HOH to go smoothly. Can for once the worst case scenario not happen to us. 1:20am – 1:45am Justin joins Shelby & Morgan again in the HOH room. They talk about random things like music. Justin – I truly feel like people don’t really know who I am. I feel more comfortable being able to come up here and talk to y’all. I want to do the best that I can to uphold everything that we agreed to. Shelby – just don’t leave this veto to fate. I knew eventually I would have to take her (Danielle) out. I will look really f**ked up if you’re (Morgan) America’s nom and I’m taking you down (using the veto on her). Morgan – if I am America’s nom .. hopefully I win the veto for myself and able to pull myself down and not have to worry about stepping on any toes. But as long as Danielle or Jason don’t get the veto, then we’re still in a good position. Shelby – you’re not just f**ker her over, you’re ensuring you get the care package. Justin – can I be honest with y’all!? I’ve never trusted Danielle. I just get that vibe from her. Morgan – that’s why we’ve wanted to take something from her… she’s presented things to us and then time and time again she backs out of what she presented to us. Shelby – its scary how fast she is ready to sell out her own side .. so obviously she would sell us out. Justin – its just nice to come talk to y’all. Y’all really do have souls. I’m going to fulfill my side of the deal. 1:45am – 2:30am Shelby – big brother is about making big moves.. and if you want we’ll do the stabbing for you .. it will be front stabbing. Justin – but how do I know you don’t want to backstab me? Shelby – we want Kryssie and Jason out. Morgan – we want them out one after the other. Shelby – And you get the care package which will probably get you to final 4. I’m not going to f**k y’all over. Morgan – the target next week has to be Jason. He even told me that he was planning on throwing the next HOH.. he wants to win the one after because he knows no one is taking him. We just need to get through this week first. Justin – I got you. Morgan – I have a ton of faith in us. Justin – I’m going to ride out with this. Justin leaves. Shelby – if this works, convincing them to vote out Jason next week is going to be hard. Morgan – I know people say we come off as soulless but that just means you haven’t taken the time to get to know us. Shelby and Morgan go to sleep. Jason and Danielle are something else! Smash their balls Ball Smashers. They got a whole lot of nerve thinking that reneging wasn’t going to bite them in the behind but they got a big surprising coming and i can’t hardly wait! I’m so sick of hearing Jason complaining about not having money. Aspire to be more than a “stock boy” in a corner grocery store. There must be a Wal-Mart in the area. Also, STOP SMOKING! It’s very expensive. Then he could move out of mommie’s basement. PLEASE take Jason out. Come on Shelby. I think she needs to put up Jason and Justin as a pawn. This way Dani can go up as America’s nom. If Dani is on the block…there’s a good chance Morgan will be 3rd nom(I hope not), but we all know they won’t put Kryssie up. That’s evident from the last 2 America’s noms..ie..Scott/Alex. So leaving Dani off ensures Morgan’s safety.They need to be thinking more about that than making deals with Justin and Kryssie. Bc you better believe if Morgan is 3rd nom the others will just vote her out…leaving Shelby to fend for herself during a wk she can’t compete for HOH:( There’s no way Kryssie and Justin will vote out Danielle over Morgan. Jason will not let that happen. As much as I like these girls, they’re not the smartest. LOL. I was so mad last week when they were dancing in the HOH room after believing every word Jason and Danielle had just sold them. I thought they were smarter than that, especially Alex. Leaving Danielle off also means if she wins veto so what….Morgan’s still safe and has a vote. If she’s Shelby’s nom and wins the Veto then Shelby has to put up Justin or Kryssie and the remaining one and Danielle will vote out Morgan. So please Shelby…….think this through. If you could actually trust Kryssie and Justin then it would be great, but you have to know Jason is swindling them. Jason has Kryssie, Justin, and Danielle thinking each of them are his number 1.
have been a bs fan from the beginning of this game. Its truly amazing these girls stayed true to their alliance with exception of Whitney. I think America will nominate Kryssie this time fingers crossed of course. Shelby is still gonna nominate Danielle and Jason. But what really scares me is yesterday when Justin asked them what if Jason or Danielle win veto, who will you put up. And they replied that Morgan can go up as a pawn. I hope Shelby thinks about the possibility of them taking Morgan out instead, and wouldn’t take the chance. That would most definitely be a $250,000 mistake. Please be smart Shelby and not risk it for those people who have continue to lie to you. My thoughts on Double Eviction night:) I am completely SHOCKED both girls are still there!! Thank God, but still shocked. I really didn’t think they’d survive. Pretty crafty of them to make the Veto keep Shelby and Morgan safe. I’m super excited they did, bc I am and always have been team BS. However, from the other’s point of view, I can see where it looks suspicious, very suspicious. BB will always do what they have to do to make things interesting and keep the viewers. Can’t blame them for that. I was also blown away at the HOH comp. That was mind blowing. I went back and re-watched and timed them. Shelby was at 9mins 47 secs before she even figured out the right path to win. Even with a broken mirror she didn’t know the right path until then. 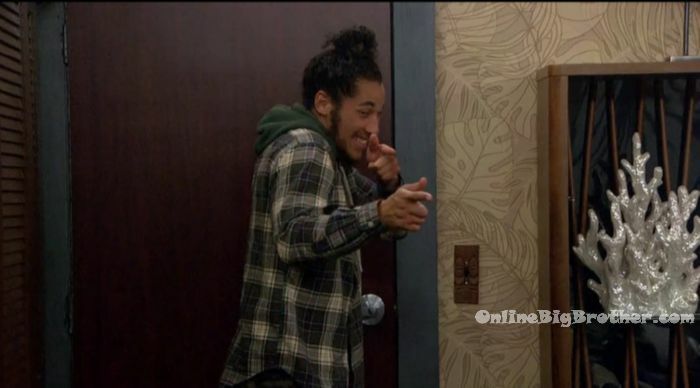 Which means Jason would’ve actually won that:( I’m glad they gave Shelby a second chance with a non-broken mirror, just bc I’m a fan of Shelby, but if we’re all being honest here……Jason won that HOH. I would’ve been so sad if he was HOH, but it should’ve been his. Willow…have you not noticed that production has cameras everywhere. These people are being videotaped with every move they make. So, I’m sure they are being fair. I’m also sure, they looked at the taping to make sure it was true about the mirror and timing. It took forever for them to start again. I made sure to stay awake to watch it! Thank you production, for being fair. Go BS!!!???? No way….there’s cameras everywhere?? You’re $hitting me?? When did that happen? HHHmmmmm, must’ve missed that!!! OF COURSE I KNOW THERE’S CAMERAS EVERYWHERE. IT’S BIG BROTHER!!!!!!!!! I’m just saying go back and watch the comp AND time it. It is past 9mins b4 Shelby even gets the pattern figured out. I love Shelby(always have) so I’m super excited she got another chance. But I can also say that it was messed up…….bc IT WAS!!!!! Believe what you want. I really Kryssie is 3rd nom this week!! Her live DR shows what a nasty person she is. Well the girls are getting fooled again but, by Justin this time. He just told KRYSSIE he is making them believe that if Jason wins veto for him not to use it. Also he can’t wait until he’s able to tell Shelby he’s always hated her guts!! Justin AN!! !